Probate is the legal process of administering the estate of a deceased person to resolve all claims against the estate and to distribute the decedent’s property and assets as stipulated in a valid Will. A Will is a written document that details how you want your property and assets distributed after your death. It is important to have a properly prepared Will with your wishes legally identified while mentally competent; otherwise your property and assets will be distributed in accordance with Alberta legislation called the Wills and Succession Act. Under the act, the court will administer your estate instead of your wishes being carried out. By having a Will, your property and assets will be distributed exactly the way you intend among family and beneficiaries. This can spare them from uncertainty and probably save them time and expense. Radke and Associates has prepared over 10,000 Estate documents, so you know you can depend on us to prepare your Will with expertise. We are also pleased to offer special pricing for seniors. Designating an EPA entails having someone of your choice representing your financial interests should you become mentally incapacitated. A Personal Directive instructs health care providers as to what kind of personal and medical care should or should not be implemented should you become seriously ill and are unable to make those decisions for yourself. A grant of Probate requires a Court application. It is mandatory in certain circumstances. Radke and Associates has extensive experience in preparing such applications and assisting the Executor in discharging his or her many duties. 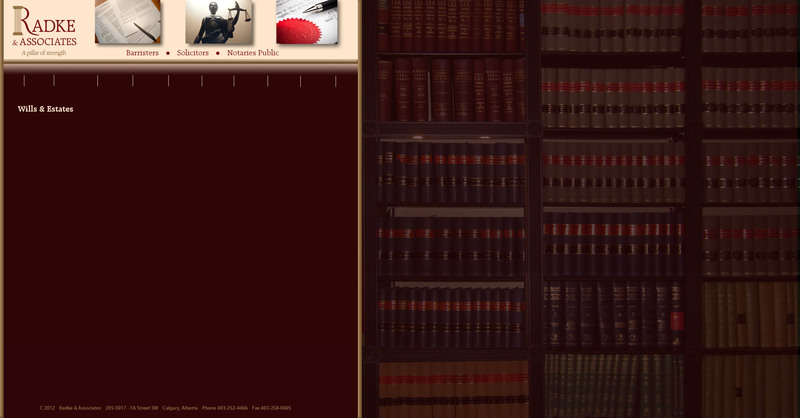 We would be happy to answer any questions you have about this complex area of law.